I like to stretch out rosé season as long as possible, and now that the nights are flirting with freezing, I’m stretching it indeed. But my goodness, I know of few other styles of wine so broadly consistent as the long-maligned pink. How many dry rosés have I tried, made with who knows which varieties from heaven knows what godforsaken backwater — and they’re almost all at least good. Why is that? The theory I’ve adopted is that since rosés can be tough to market, winemakers who choose to make them make them from the heart. These aren’t dumbed down to appeal to everyone, so the wines have a point of view, and have a good chance of reflecting the vineyard’s terroir. The winemaker is, hopefully, expressing him/herself with the rosé, and perhaps having a little fun. And fun is the point of a rosé — it should be lively and joyous, if not necessarily deep or complex or profound. But even I have limits, and I find it difficult to work up enthusiasm for rosé in the winter. That’s why it’s important to pick up a bottle now and open it immediately, while the leaves still have a touch of green. You could do much worse than a 2011 Kir-Yianni “Akakies,” which will likely be my last pink of the season. Yep, it’s made from a who-knows-which variety in a godforsaken backwater, and it’s great. In fact, it’s made from Xinomavro, one of the three grape varieties starting with “X” listed in The Oxford Companion to Wine. The name means “acid black,” according to the Companion, and it’s “one of the few Greek vine varieties which may not reach full ripeness in some years.” Perhaps that’s less the variety’s fault and more due to the fact that it’s popular in the cool, high-altitude vineyards of northern Greece. This particular Xinomavro is a 100% varietal from Amyndeon (as spelled on the label), a region in inland Macedonia just south Greece’s border with Macedonia the country (as distinct from the Greek province of the same name). Adding to the geographic confusion, since Greeks use the Greek alphabet, the Arabic spelling of place names can get creative. In my various wine tomes, I have found it spelled Amyndeo, Amyntaion and Amindaio. In any case, the region on the northwest side of Mount Vermio “is so cool that it can produce aromatic whites, a denominated Xinomavro rosé, and good sparkling wine,” according to the Atlas. I was delighted to see Sotheby’s note that the “brilliant” Alpha Estate is realizing the full potential of the Amyndeo terroir with its fine Xinomavro-based red blends. I first wrote about the Alpha Estate “Axia” here, and I liked the wine so much that I served it at my wedding. But let’s get back to the Kir-Yianni rosé, because with autumn fully upon us, there’s no time to waste. A deep pink color, it smelled of sweet cherries and watermelon. On the palate, it exhibited juicy fruit, a slight prickle on the tongue, some tightly wound acids, a chalky midsection and a tart finish. A fun ride, and delicious paired with some slightly spicy red beans and rice. So even this rosé of Xinomavro from Amyndeo (or Amindaio, or Amyntaion) — a risk if there ever was one — proved to be quite fine. Which again goes to show that taking a risk on an unknown dry rosé isn’t really much of a risk at all. 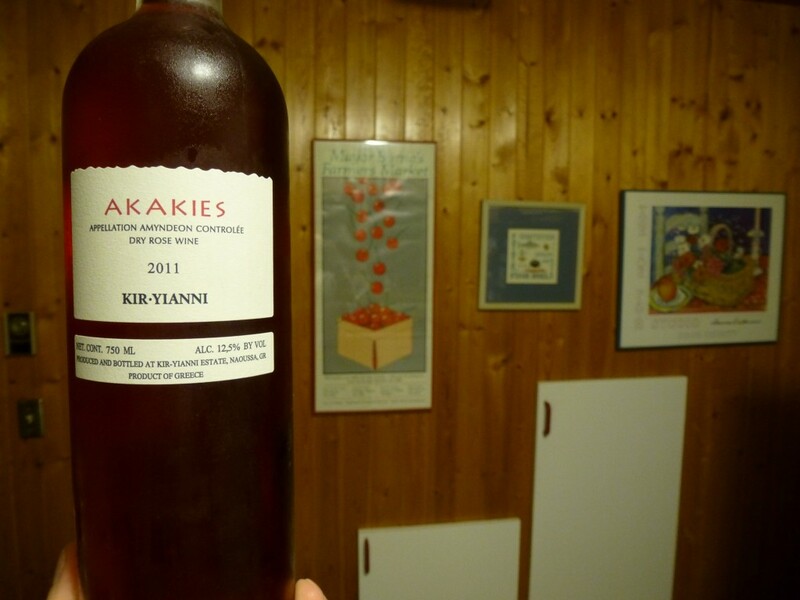 2011 Kir-Yianni “Akakies”: Fruity, but tight, focused, minerally and tart. An excellent choice with food that’s lightly spicy. Chill well in the refrigerator before serving, and serve it soon. Its summery flavors will soon feel out of place. Find It: I purchased this bottle at In Fine Spirits for $15.50, and I see that Binny’s also carries it.